I’m not even sure where to start with this, or where I’m going, and I’m not done yet. The simplest version is, I had an idea for a painting. It came into my mind complete, and gorgeous, and I had no idea how to do it. It was outside my realm of experience except for the fact that I’ve used oils, acrylics, paintbrushes, and canvas. It is a portrait of Scott, with a wildly colorful background, surrounded by these bubbles of inspiration. My first thought was, I can’t do that, I have no idea how! My next thought was that I could figure it out and that this was an important painting to do. For all the times I’ve told the muses, “later,” it was time to act upon it now. That was a couple of weeks ago. 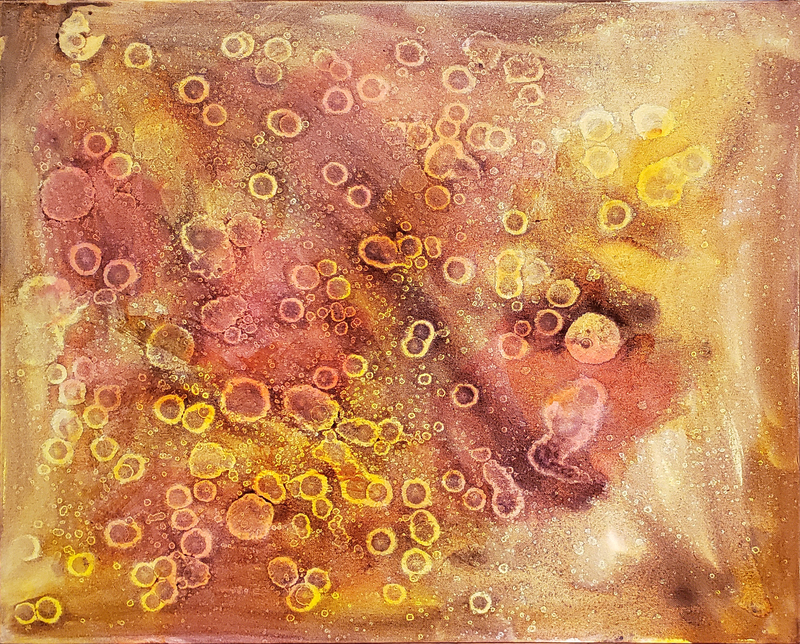 The first half of the week I researched how to create cells with acrylic paints. Then my room became a studio in earnest as I began to experiment with what I had learned. Everything is right there in Youtube videos, but not everything is in the same video. I had a blast! 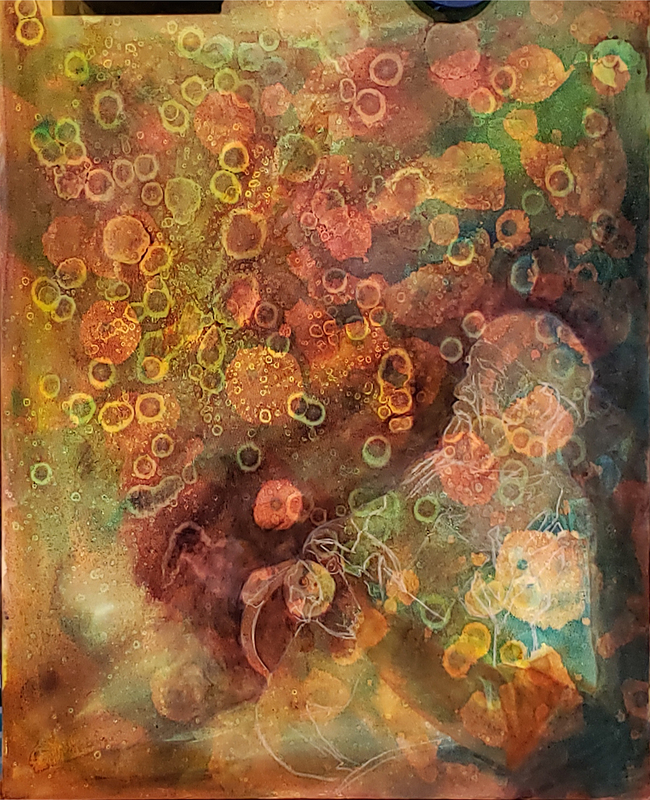 I started with small canvases, different color schemes, different thicknesses of paint, different strengths of alcohol, and differing amounts of water. I could have viewed this entire process as a failure because the first few days I worked with this technique, I didn’t get the colors or the results I needed. Finally, I started to get the cells that I wanted to move forward with the larger canvas. Then, I began building up the colors that I wanted. I discovered how to make different types of cells with alcohol. I was finally on the right path! This continues to be an eye-opening experience. I don’t know what I’m doing next until I get to that point. I’m figuring it out as I go along. I’m Trusting the Process. No pictures this time, I’m afraid. I’m going to tell you a little story. It’s a story about fear, of discovery, of love and despair. It’s a story of longing and exhilaration. It is how my process works, and for this, I need more coffee. I believe in Muses. I believe in Inspiration being a living thing that comes and visits; sometimes while I sleep, and also when I am awake. The reason I believe this is because it happens to me. It has, all my life. I’ve had it happen with music; where entire songs with lyrics will flow through me and pass on, and once, it was a symphony. I’ve had it happen with books, and now, it happens with art. The images that I see are so perfect, so complete, that I feel a visceral impact of wonder, desire and awe all mixed up together. Sometimes it is sculpture, which I am nowhere near ready for, block printing, and wood carving. Most often though, it is paintings. This past year, I received images of complete, 3-foot by 6-foot stretched canvas portraits of Goddesses and Gods. These were so complete they raised goosebumps on my arms. I told the muse that I would be willing to undertake this work at a later time, ONCE I KNEW WHAT THE HELL I WAS DOING!!! I didn’t tell it, no, I simply told it later. See, this has happened to me for a long time now. From the time I was a child, I would get glimpses of paintings, of music, of prose, and I just turned aside. I didn’t know how I was going to bring it to life. I was afraid. Now some of these things have definitely been beyond my skill level, such as the symphony. I had no paper, pen, recording device, and that work of art flowed through me and was gone. There was no waiting for me. Perhaps it was just a glimpse of where my life could have taken me. Many of the songs and poems I have written came to me in just this way. Now, though, I AM working on fine art skills. This is one of the many reasons why I am taking these art classes, and why I continue to learn. I need these skills to bring these paintings to life, these and so many others that have come to me even in the past couple of years. I have better than one hundred paintings waiting in the wings at the moment. However, I’m not willing to stretch 18 square feet of linen canvas in the hope that I create something that might sort of look like the image in my mind. Not happening. I don’t know whether the paintings that have come to me in the past will wait until I have the skills necessary. The great news is that new ones just keep coming. I do thumbnail sketches of each of these paintings. I document what I’ve imagined using pictures, sketches, words, whatever it takes to make a record of it. I have an atelier painting class coming up to continue to improve my skills. I’m studying color theory and harmony. I’m finding people in similar poses that I can practice drawing in preparation for these paintings. In short, I’m teaching myself the skills I need to bring them to light. I have asked Inspiration to be patient. I want to complete a couple of portraits before I work on that body of work because I will need to work on all of them at the same time. Hell, my room isn’t big enough for that!!! Meanwhile, the Muses paid a visit about a week ago, again. This time with a portrait of Scott. I don’t know if I have the skill to render the vision I have in my head, but I’m going to do my best. I’m tired of the fear. I’m tired of saying “no” when these ideas come to visit. See? See it in my head? No? This time, I’m going with it. This time, I want to see where it leads. The idea came to me as a completed painting, the size, the colors, the subject. When I get these ideas, they start as crystal clear visions in my mind. The work I see is always the work of a Master. I get goosebumps just thinking of it. In the past, I’ve always said, it’s not for me, not yet. This time though, I am going to follow the muse down the rabbit hole. My family has been supportive of this. They are always curious about what I come up with next! I can tell them what’s in my head, but they can’t see it any more than you can. When I took this first step, it was like getting ready for a date. The excitement was incredible. I love problem-solving, but this was at a whole new level. I wandered through all the art supplies I had on hand, figuring out what I had that I could use. I knew I needed to use acrylics for the background. I watched videos on how to create the cells I was looking for. I started experimenting with small canvases to see if I could achieve the technique I wanted. I failed. I did more research. I tried something else. I got closer. Finally, I achieved the cells I wanted! It’s like I have someone looking over my shoulder cheering me on. “Yes, like that… now, a little more color. How about a bit darker?” This week has been like a first date. The muse is like someone that has had a crush on me for years that I ignored until now and finally agreed to that first date. I’m expecting this to be a tumultuous relationship because I’m afraid. I’m afraid he wants more out of me than I am currently able to deliver. I’m afraid he’ll leave me if I’m not good enough! I’m of two minds about this as well. On the one hand, I have a firm belief that if I can think it, I can create it. On the other, I’m seeing these masterpieces on huge canvases and I know I don’t have the skill, the time, or the materials YET to pull those off. Yet. How patient can he be? So for now, I’m respectfully asking that we take smaller steps in our relationship so that we can get to know each other better and develop that trust. I promise, my next post will be the beginning steps of the portrait! A new painting is in the works, and it is coming along nicely. I’m not sure why, but my paintings tend to name themselves these days, so the working title, at least, is Sailor. I like where it is going even though I have a long way to go! My drawing class has ended, although I plan to keep drawing regularly. Now, I’m working my way through Alla Prima II by Richard Schmid. This is an amazing book. I’ve made it to color charts, and that is where I stalled for a bit. He used only 11 colors for his color chart combinations, and I had some difficulty choosing mine. Many of the colors he uses are colors that just aren’t in my usual repertoire, and after having read the first half of the book, I’m changing my color palette to more closely mirror his. I’m such a perfectionist that even starting this process was agonizing. Then I laugh at myself for my foolishness and forge ahead anyway. I know how important it is to know what my paints can do. 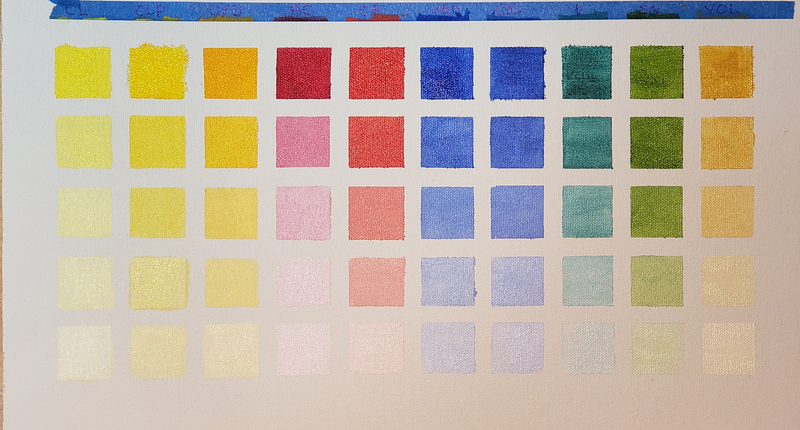 I did these charts once with my acrylic paints using a completely different set of colors, and it is now time to do it with oils. I will have to do a set of secondary charts because there are additional colors that I use regularly and I will need to know how they mix with this lot. For now, though, I am starting with the basics, warm and cool colors in each category of yellow, red, blue, and green. The purpose of this is to learn how these specific colors interact with each other. 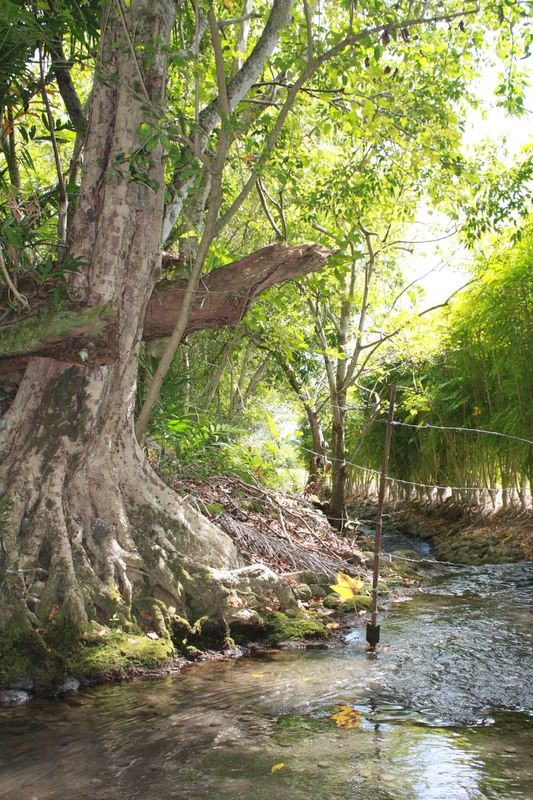 After doing the first mixing chart, I remembered a photo that I took years ago in Waipio Valley. I never had the courage to paint it because I didn’t think I had the skill I needed to do it justice. This one color chart just showed me most of the colors I need to use to recreate this scene. The color harmony from using Cadmium Lemon Yellow as the base color for most of it would maintain the light, ethereal feeling of the landscape. The exciting news is that I have 10 more paint charts to go! I thought you folks would like to see something other than black and white drawings. 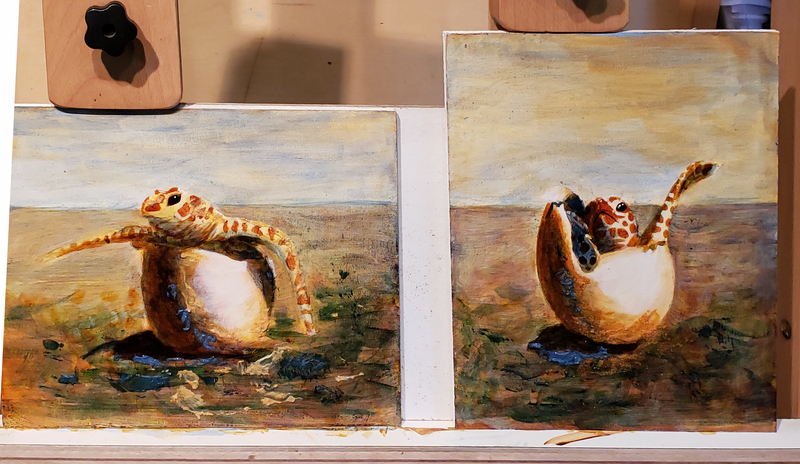 Here’s what I’m working on now, I call it Turtle Twins as a working title. I’m working in Acrylics once more. I found this amazing glass bead gel medium and I have been wondering how I can use it. 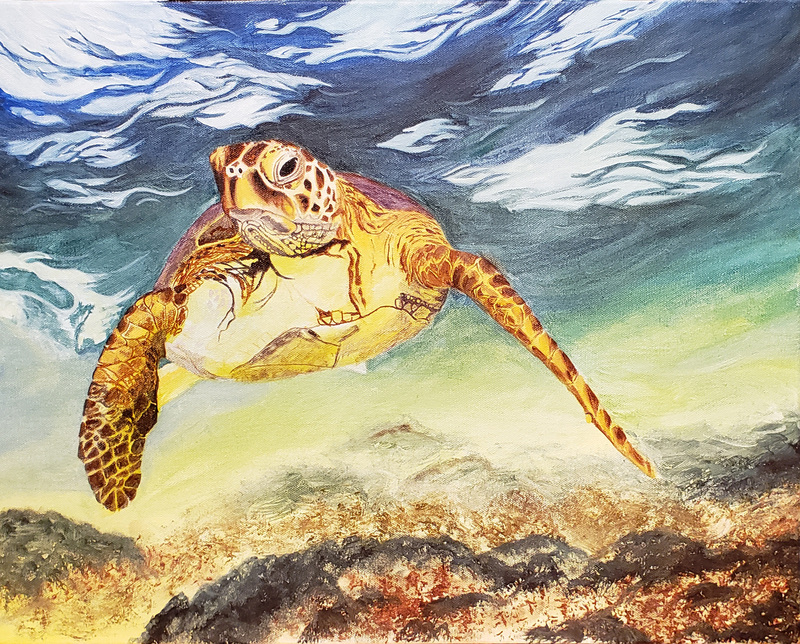 When I found pictures of baby turtles hatching from their shells covered in sand, I knew what I was painting next! I’ve looked, and haven’t found an equivalent option for painting in oils, so acrylics it is! The bright blue is the glass gel medium that hasn’t dried yet. It will be much darker when it’s done. 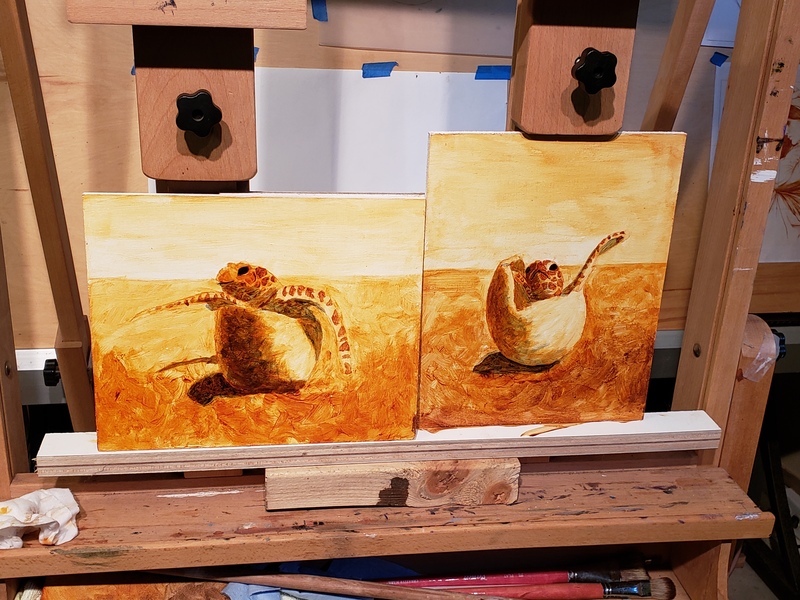 These two cuties are 8 x 10 on masonite panels. I will post more photos once they are finished. New Paintings in Progress! Baby Turtles. This is a bit of a challenge because I’m doing it in Acrylics. I wanted to use a glass gel medium that I found a while back, and this will be the perfect opportunity! I’ll post more updates as I work on these. I finally got around to working on my homework for class yesterday, and I hate that I lost time this week. I gave it about 6 hours, since that is what I had available, and it needs at least another 4-6 to make me happy. Between running a business and finishing up a current painting sometimes real life gets in the way. I didn’t spend as much time with my measurements as I needed to be because I wanted to spend the time practicing my shading. I thought I was careful taking a photograph of my set-up from class and I found out when I sat down to work on my homework, that the real-life image was lower than the image in the camera. 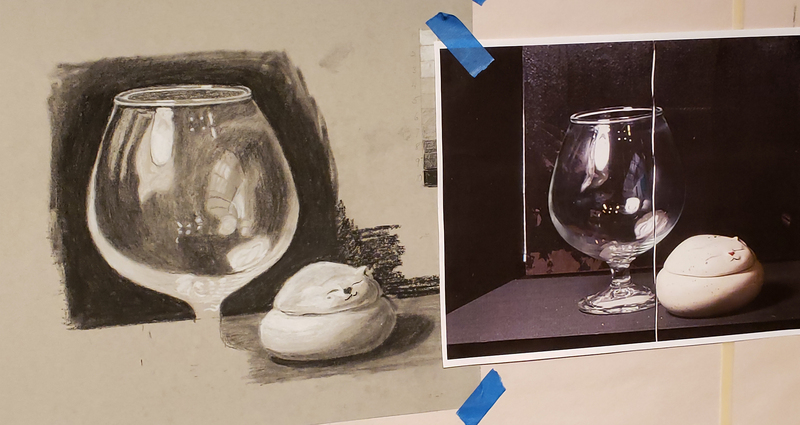 All my angles for the ellipses in the glass that I had measured on my drawing had to be corrected. (Good practice, I told myself!) Then, I couldn’t get the proportions from the photo to match the proportions in my drawing. So I used my proportional dividers to scale up from the photographed image to my drawing. Basically, I had to redo the whole drawing from the picture I took because EVERYTHING WAS OFF. Next time it will take me less than an hour and a half to figure that out. What are proportional dividers you ask? They are an awesome tool for scaling up or down the size of an image. 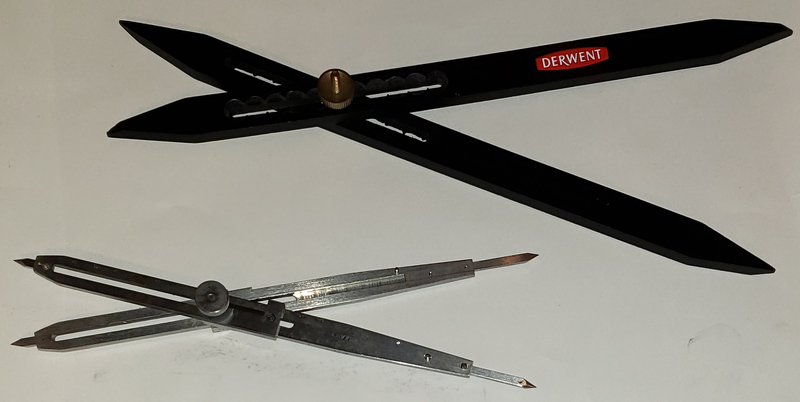 For measuring when you are sight-sizing you can use a compass or a stick to find and record 1:1 measurements, but when you need to scale up or down from the original size, proportional dividers are the tool you want. I knew they existed, and didn’t know how to search for them because I didn’t know what they were called. I now have two pair. The black dividers are now easy to find online and I see them in stores as well. They are a little clunky and good for basic measurements. These are adjustable by moving that middle knob either further to the left or the right to modify the ratio. Once you figure out what your ratio is, say 1:3, as long as you don’t move that middle screw, everything you measure with the small end (1) will be translated to three times its size on the other end of the dividers. The second pair is a Russian drafting tool from the 1960s. After trying the black ones, I needed something with more precision. This is my first drawing on toned paper and I think I like it. I still have to fix stuff and darken down the bowl of the wine glass, and I still like it so far. I’m always amazed when a drawing of mine is recognizable. Isn’t that silly? Six hours in and a long way to go to make me happy. There’s so much to do in this class that sometimes I have to be content with just figuring out the concept of what needs to be done and move along. That’s what happened with my cups from the last class; I had to be content with understanding how to measure out the ellipses. I still have the still-life set up, and I may revisit that with toned paper. I haven’t decided if it is the best use of my time though. 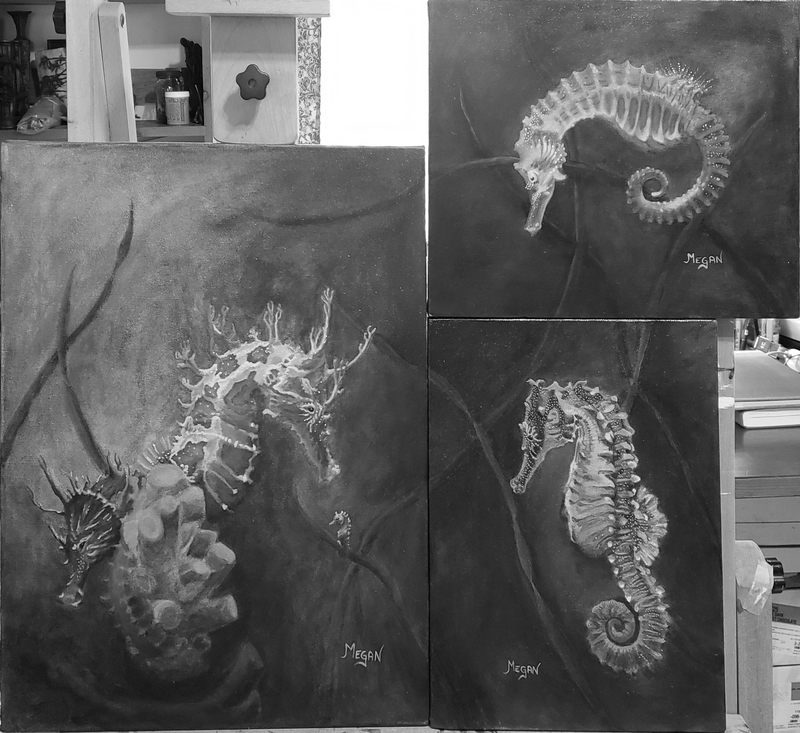 The first three paintings are finished and with the photographer now. Here is the fourth, completely different, and very cute. 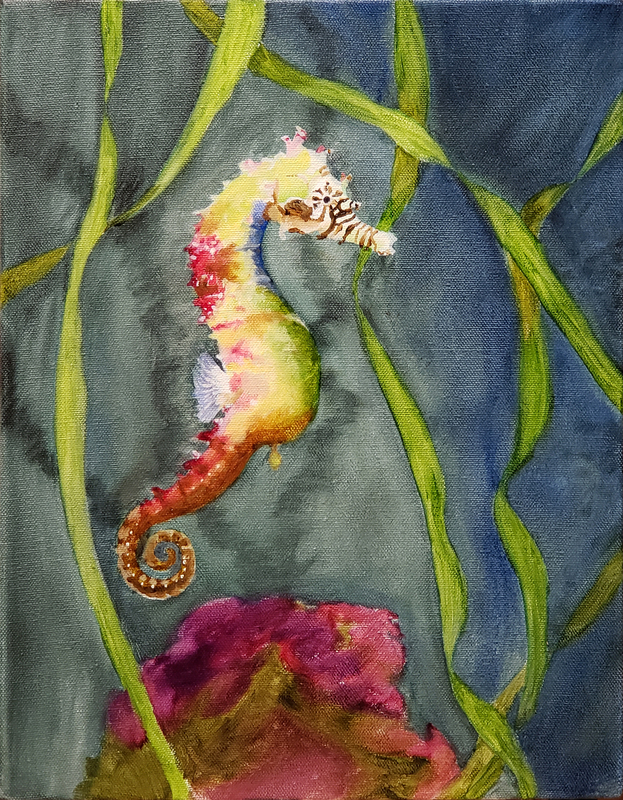 This is a rainbow seahorse, an endangered species, and I thought it was a great way to finish off the series. I’ll post a picture when it’s finished. I’m so close. I’m so close I’ve actually signed the paintings. I still can’t let them go. There was something about the third painting that just wasn’t quite right yet, and I didn’t know what it was. This month, my focus, in general, has been on asking the right questions. It’s easy to ask something silly like, “Why do I always do this?” to which your brain will answer, “because you’re a schmuck!” It takes thought to ask the right questions, and the right questions are the ones that propel you forward in whatever you are doing. The movie I Robot was all about asking the right questions. Here was my dilemma. I have this set of paintings. They look awesome. However, the large one just isn’t up to the level of the other two. I looked at them on my phone. I turned them upside down. I went outside and looked at them through the window. I turned the easel around and didn’t look at them at all for days. I’ve been stewing in my own juices wondering what I’m missing. Yes, I’m stubborn. I wanted to figure it out for myself! Since my theme this month is about asking the right questions, the answer was, obviously, that I was asking the wrong ones! 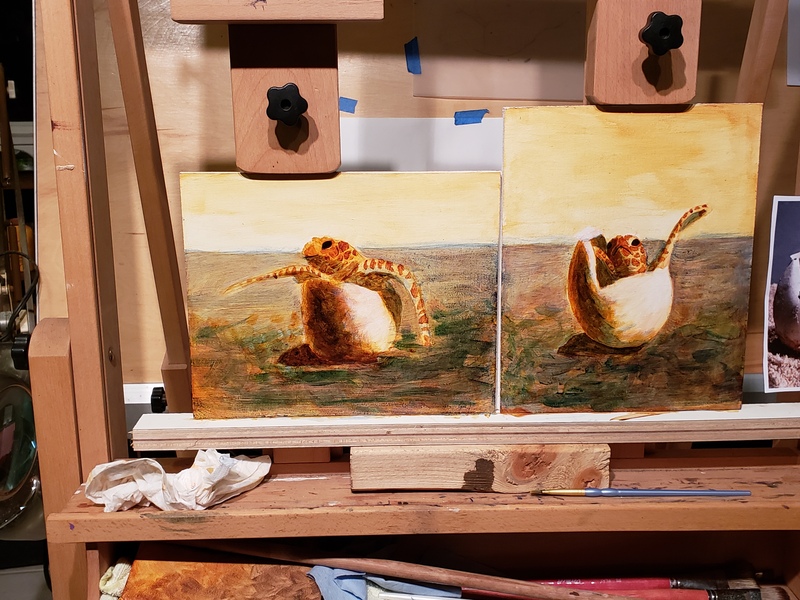 See how the smaller two paintings jump off the canvas? The third one in comparison looks flat. It is still gorgeous, it just isn’t there yet. This is what was missing, the delicate shading that brings the other two to life. Soon… I’m almost there! I have had people ask me, what draws you to a subject? Why do you paint what you do? What inspires you? Most often though, what I paint is an expression of the ephemeral qualities of life, a moment in time. The drawing above is a prime example. I sat on this photograph for years. I knew I wanted to draw him, and I also knew that I didn’t have the skills at that point in time. So what I did, is to draw my way through 4 drawing books, 3 by Andrew Loomis and another fellow (I’ll have to look it up since it isn’t coming to me at the moment) until I felt comfortable approaching this image. To me, this photograph of a man was a window into his soul. 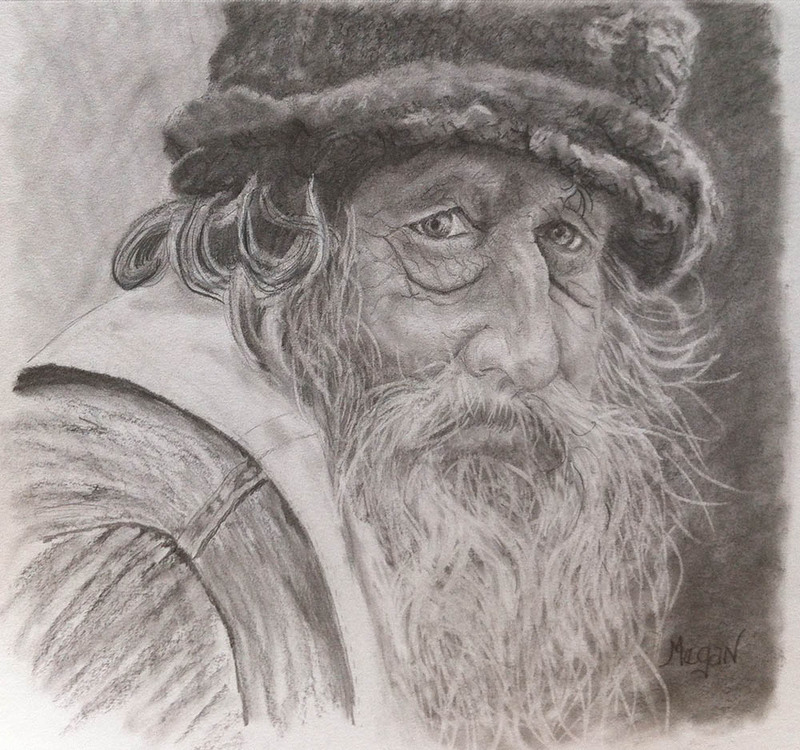 I didn’t want to do the drawing until I knew I could do it justice, and express what I saw there. The most amazing thing to me about this whole thing is that I thought I could do it!